A week after union contracts expired, workers have voted 96% in favor of striking at 24 hotels across Los Angeles and Orange counties, including the Andaz in West Hollywood and nearby hotels such as the SLS Beverly Hills and the Beverly Hilton. The vote comes after a record-breaking 20 hotel strikes have already been carried out in over 10 cities across the country so far this year. The vote also comes on the heels of strikes being settled in San Francisco late last week, and Hawaii the week before. Unite Here said it has been in negotiations with employers for months with a list of demands ranging from more affordable healthcare, to the implementation of panic buttons, increases to pensions, stronger protections for immigrants and wages that reach $25 per hour. In recent months, Unite Here has been especially active in West Hollywood. 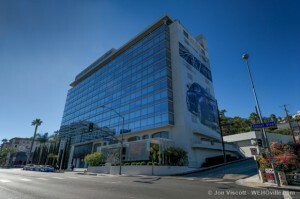 It launched an unsuccessful campaign earlier this year to force the West Hollywood City Council to rescind its approval of a nine-story hotel as part of the Robertson Lane development on Robertson Boulevard. It was successful in getting a measure on the March 5, 2019, city election ballot that would, if approved by voters, rescind the city’s approval of the Arts Club project on Sunset Boulevard at Hilldale. Unite Here recently filed an objection to a proposal by the Mani Brothers to convert the Piazza del Sol building on Sunset Boulevard at Queens Road into a hotel. That objection led to a postponement on Thursday night of a city planning commission review of the project. And it has put forth a proposal for a future ballot that would require a 24-month moratorium on the construction of new hotels in West Hollywood. The hotel industry is a major part of West Hollywood’s economy. The city currently has 20 hotels and motels in operation, with the Edition on Sunset scheduled to open soon and the Sunset Time under construction on Sunset Boulevard at Olive Drive. The hotel room occupancy tax is the source of 26% of the city’s general revenue. What the Great City of West Hollywood needs to do is exactly what the city of Seattle did a few years ago and raise its minimum wage, which is now actually $15.45 per hour. All the right-wing libertarian think tanks like the heritage foundation and cato were telling us that Seattle was on the verge of the apocalypse with the economy soon to crash and, murder and mayhem breaking loose. This all because right-wing white males were going to leave in droves causing a collapse human civilization. Well, here we are a few years later and all that’s happened is major job growth, increased spending, and a robust economy due to the flow of cash. It turned out increasing the minimum wage was the ultimate stimulus for the economy, with economy booming job creation in Seattle is rapidly increasing rather than collapsing the entire economy of that city. Rather than losing jobs, they’re creating jobs at a pace faster than the rest of this country. When the rich get tax cuts as was done nationally with this past entire year of the republican tax cuts, and all of that money that was supposed to trickle down to American workers has instead been used to enrich the corporations that received the tax cuts. This isn’t a surprise to anyone with even a basic understanding of economics, but it does go to show that republicans are habitual liars when it comes to their policies that were never intended help the American middle class and, ONLY enrich corporate elites. On the other hand RAISING the minimum wage works by increasing the take home pay of the people who live paycheck to paycheck who put more money going into the economy, creating more demand domestically, which creates jobs. This creates real economic growth. This creates new opportunities, and effectively combats many social problems without the need of a paramilitary police state. Of course right wingers will seek to completely deny these results which are consistent with all those people releasing the studies in this area. There is no reason for anyone to stay in a low wage job any longer than it takes to prepare for something better. LA has quite a few trade and tech schools that provide a low-skilled person with the training to get work in a field that would give them what they keep demanding in their current jobs doing menial labor. Public schools have adult classes teaching English as a second language. An employer pays what a job is worth, and it’s arrogant for a worker to expect to be paid more just because he says he needs it. What is a “living wage” really? These are “transitional” jobs, and are not intended to provide for an entire family for a lifetime. When a worker is hired, is the employer supposed to ask what the worker’s expenses are so that his wages can then be determined; how many children, how much is your rent, do you have a car in good working condition? It is incredibly condescending for those of us who have done better to assume that low-skilled laborers are not capable of doing better for themselves. If they get this “living wage” they are being enabled to stay right where they are, and are not going to be incentivized to stretch themselves to become more than they are. There seems to be some sense of superiority that we have a duty to take care of these poor creatures who aren’t capable of doing any better for themselves. Actually, WE have no intention of doing it! We’re demanding that “billion dollar corporations” do it. Then WE get to feel good about ourselves. And how is someone supposed to pay for these wonderful “trade and tech schools” which will magically “get (them) work in a field that would give them what they keep demanding” when they don’t even have the money to eat without food stamps given their horrible, non-union hotel wages? Again, get real. And stop Ann Rand-ing. We see you very clearly. I don’t know who Ann Rand is. There are loans available, often based on a sliding scale, and repayment doesn’t begin until after the completion of the program. Very low income students frequently are not required to pay any fees. I know a young woman whose gangbanger father of her children got himself killed. She went to West Valley Occupational Center and completed a program (I don’t remember what program she was in), after which she got a good job. I stand by my position. With very few exceptions poor people can do much better than menial labor. I have known too many people who have done it to think otherwise. My sister got herself through college working in a hotel cleaning rooms. It was a transitional job for her, but she wasn’t too good to do it. The key to commanding higher pay is improving one’s education and skill set to match the needs of companies that hire for higher paying positions. The expectation of $25\hour for a hotel worker job is absurd and if that became the minimum it won’t do much to change their standard of living for very long since the consequence of such wage inflation will put them right back to the lowest-pay status they’re presently at. Mandating an artificial value (be it $15/hr or $25/hr) for such menial, low skilled jobs will result in companies throughout the local economy then needing to raise the pay for other jobs higher up the skill\productivity scale (like those already paying $15, $25, etc) since their value will be degraded by the imposed fake value of the new minimum wage. To sustain this, businesses will have to raise the prices of their goods and services, resulting in the minimum wage earners cost of living not being any more affordable than it was before. The proportion of their pay vs those of higher skill and productivity will be the same, just with a new number representing the difference. With 96% of the workers having voted in favor of striking, I’m guessing that we won’t be seeing the usual right-wing arguments about all the workers being overcome with the desire to just “walkaway” from their unions? The problem here is NOT that we don’t have the money to pay workers a living wage but, we are intent on allowing there to be no limit on the avarice of corporate elites. Now if the workers were allowed to share fairly in the profits generated by their workplace, they would be far more willing to do more to raise them. Better yet if they owned and controlled the entire means of production like an employee owned co-op, they could do an even better job. When profits are kept almost entirely to major share holders and boards is when great inefficiencies emerge (to say the least) throughout the system as a whole do to the suffering of the working people. The City Council of the Great City of West Hollywood should follow the lead of the City Council of Seattle by positioning itself as a municipal version of a labor union in supporting precisely the sort of benefits that unions were built to fight for, before corporate globalization completely undercut the labor movement’s power. The $15 minimum wage was only a great beginning! Now Seattle is trying to build a whole safety net for workers’ along with Public Housing and Free Public Higher Education. There is a clear trend of municipal social justice sweeping City Council politics all over the country and, West Hollywood should be a leader in this area! Our City Council should take inspiration from a twice elected Seattle City Council Member, Economics Professor and, Socialist Alternative Party member named Kshama Sawant who openly calls for a National Program of “Municipal Socialism!” Let’s see West Hollywood Mayor John Duran step up to the challenge on this one! The Beverly Hilton best figure it out before the Golden Globes on January 6th. If accommodating these workers demands, of course, the hotel companies are not going to just accept getting lower profits, so will raise prices much higher, likely resulting in less business – and\or invest more in automated processes (robot room service, housekeeping tasks, etc like some big hotels have already started), in either case, resulting in needing fewer employees. So hoorah to those who’ll get bigger paychecks and benefits but sad situation for many more who will become unemployed. No doubt that hotel workers are part of the current serf class and an excellent example of the wide divide between them and the corporate boardrooms. The idea of collective bargaining is not socialism, but it is an art form often badly practiced by those most ion need of it. Corporations, in spite of all the gooey pronouncements of caring for their workers, simply don’t give a damn as long as there are people willing to work for meager wages. Try to find a decent hotel room for less than $125 a night – even at such inns as La Quinta – in any metropolitan area in the USA. And consider that union strikes are a last option when the boardrooms refuse to negotiate. Another thought: if unions are such a great idea, workers would more easily join them rather than be blackmailed into doing so. WEHO is very much a resort city and we need the hotels. Perhaps the city could offer an ombudsman to help settle some disagreements. Yep. Thank goodness for sanctuary state and its cities and overall lax immigration enforcement and all those who vote for politicians who support those policies. Supply, demand and competition apply to an employee’s value too. Welcome to Socialism, and the reason businesses and people are leaving CA. It’s turning into a zoo like Portland, SF, etc. Good for them! These billion dollar corporations need to pay their workers a living wage and provide affordable health care.